ICU provides specialized care around the clock for seriously ill patients. Professionals trained in critical care medicine use state-of-the-art equipment to provide the best care available, and this equipment aids doctors and nurses in monitoring the heart rhythm, blood pressure, and breathing rate of our patients. 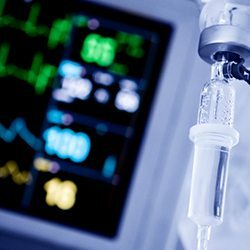 Some patients may even require the use of a mechanical ventilator while in the ICU to assist them in recovering from their illness. Our staff is highly committed to providing the best care available. We are happy to answer any questions concerning patient care, equipment, and a patient’s condition, always within the government privacy guidelines. Visitors are welcome to visit friends and family members. We encourage you to check with admission or the main desk prior to visiting to make sure your visit occurs at the most appropriate time. During the flu season (October through May), children under the age of 14 are not allowed in patient areas including Med/Surg, ICU and OB areas. This is for the safety of your children, as well as the safety of our patients. There may also be restrictions when RSV cases are present. We ask that only two immediate family members visit an ICU patient at a time. We ask that flowers, balloons, food, and drinks be left outside the ICU. By maintaining a quiet, calm atmosphere, our patients are able to rest better and recuperate faster. It is important for family members to talk to and to touch their loved ones. We believe in working together with families as a team for the recovery of loved ones. We thank you for trusting us with the care of your loved ones.